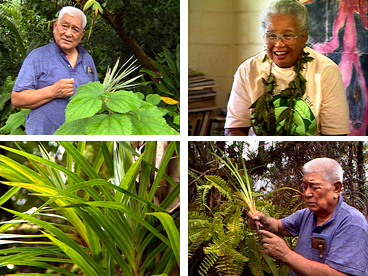 At a workshop in Keaukaha, Hawaiʻi island, he demonstrates the preparation of healing herbs and mineral rock (‘alaea). In a visit to the Wao Kele o Puna rainforest, he identifies rare medicinal plants and speaks to the importance of preserving them in their natural habitat. This digitally remastered DVD set contains two and a half hours of material, replacing the original 33-minute program released in 1991. The newly edited and expanded feature documentary and special bonus features contain virtually all the footage recorded of Henry Auwae at the Hawaiian Health Fair in Keaukaha, Hawai‘i, May 5, 1990, along with footage recorded at his residence in Keaukaha, and during a drive to and hike through Wao Kele o Puna rainforest, Sept. 27, 1989. Sabina Mahelona, Puhipau, Ipo Nihipali, Kunani Nihipali.